Lemon curd is surely one of the finer things on earth – put simply, it’s silky, smooth sunshine in a pot. With the addition of chia, this lemon curd is decorated with tiny, speckled seeds which provide a rich source of antioxidants and give a delightful twist on an old classic. It is so versatile that when I have a batch in the fridge, it is likely that I’ll have it on toast for breakfast, on crackers or mixed into yoghurt as an afternoon snack and featured somewhere in a dessert that evening. The truly brilliant thing about this recipe is that you can have the zesty, creamy goodness sans unnecessary fat and refined sugar, which is usually present in traditional lemon curd recipes. It is seriously simple – eggs, lemons, honey and the shining super food star, chia. 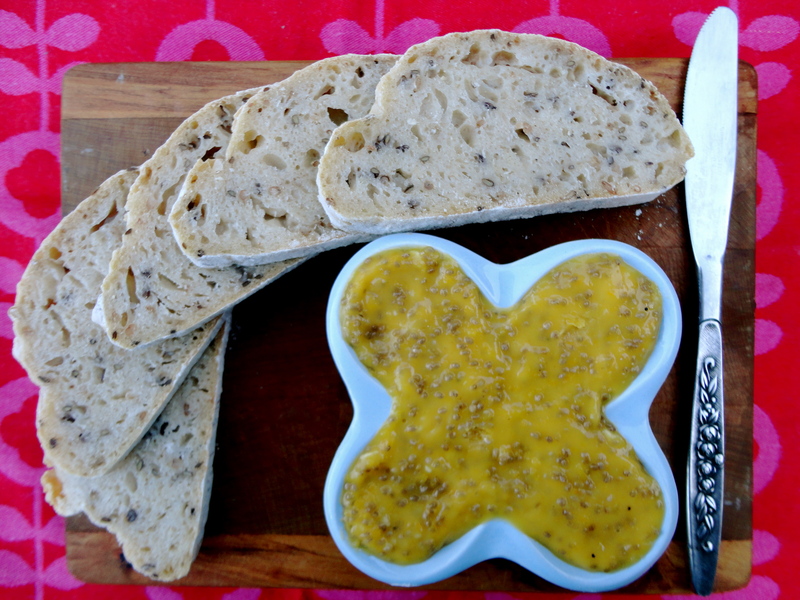 The chia seeds provide a dreamy texture and gelatinous quality to the curd which butter would usually achieve. Chia is a relatively new product on our shelves, but has been cultivated and used in a variety of ways in South America for centuries. It comes from the plant Salvia hispanica and is a member of the mint family. Chia is a rich source of omega-3 fatty acids and unlike flaxseeds, does not have to be ground to enable nutrients to be absorbed by the body. Chia seeds are also a good source of fibre, magnesium, copper, iron, zinc, calcium and niacin. When mixed with liquid and allowed to sit for 20 – 30 minutes, chia forms a gel which can be used as a vegan and gluten-free thickening agent. Basically, you can add chia seeds to anything you like – sprinkled on salads or porridge, as an energy-boosting ingredient to a smoothie or ground up in baking. Place all of the ingredients into a thick-bottomed saucepan and whisk* together at a low – moderate heat. Whisk constantly until the mixture thickens, usually about 5-6 minutes or when the mixture sticks to the back of a spoon. Take off the heat, transfer into a vessel and allow the mixture to set in the fridge for 1-2 hours. The lemon chia curd will keep well in the fridge for up to two weeks, though it will most probably be snaffled in the first couple of days. Serve with anything you like, the possibilities are truly endless. * Note: I’ve found that using a silicone whisk as opposed to a metal whisk makes for a far superior tasting lemon chia curd. I just want you to know that I just made my 20th or so batch of this lemon curd — you are right, it tastes like sunshine. I actually think it tastes best as soon as it’s done and is still warm. It’s a challenge to store it in the fridge, since I want to eat it all right away! Thanks so much for posting it. (1) I usually double the recipe and just use whole eggs instead of egg yolks (1 whole egg = 2 yolks, so a total of 7 eggs when you double the recipe). Saves on eggs and still tastes delish. (2) I cut the honey in half — and sometimes use even less. Makes it tangy and just sweet enough. (3) I skip the lemon zest because I like the smooth texture better.